A lead alloy token of later medieval to post-medieval date, circa (AD1400-1800). The token is circular in plan. The obverse depicts a six petalled flower, Powell Type 1 (Symbolic Petalled Flower) The reverse face is flat and un-decorated. The token has a cream to grey coloured patina across all surfaces which also has areas of abrasion. Lead tokens had a wide variety of potential uses such as use as tallies, gaming pieces, tickets, weights, etc. and are believed to have been locally produced; they are therefore difficult to date precisely. 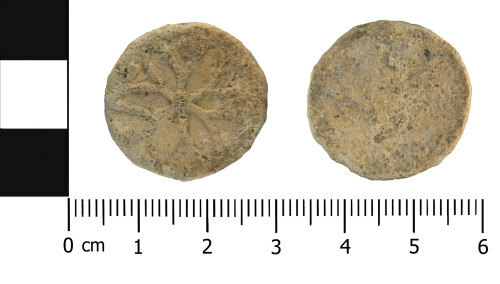 Those carrying initials are generally deemed to be Post Medieval in date (1500-1850 AD), those which seem to mimic Medieval penny designs are deemed to be Medieval, the remainder which carry stylised designs remain difficult to date but the majority are probably Post Medieval in date c.1500-1800. Powell (2012) comments that Type 1, 31, and 3 are designs which were commonly made stock and occur in large quantities, dating to the late 16th to mid 19th centuries.